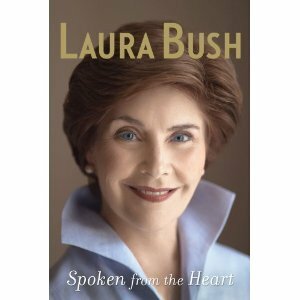 I enjoyed reading ‘Spoken from the Heart’ by Laura Bush. I have always admired her as the First Lady and so, I was really interested in her book. I found her very elegant, poised, composed and matured. This book confirmed my opinion about Mrs. Bush. It’s just amazing how much America does for the needful all over the world. It might be that other countries are as charitable but I am just impressed with generosity and charitable nature of Americans overall. I share Mrs. Bush’s love for the books. I am convinced that first and foremost it is prayers and devotion to God and then it is education that enables us to overcome our adverse situations and makes us better-off. So, I commend her efforts towards spreading literacy and improving education wherever possible. I was born and brought up in Calcutta and we had a book fair every January. I used to look forward to that book fair so much. It was my opportunity to look at so many different kinds of books. So, I am so happy to read about Mrs. Bush’s effort to start the tradition of book fair in America. I wish we had a book fair in Tupelo. If any of the Tupeleons reading this article has the stamina, time, contacts and feels inspired to start a book fair, I’ll be honored to help. Annual book fairs are a huge step towards promoting the love for books. I enjoyed reading Dreams from My Father: A Story of Race and Inheritance by Barack Obama. His life is indeed interesting. I have to say that if I were younger and if I had freedom to pursue my dream, I would have loved to try being a community organizer. After reading this book, I prayed for him to be the President of the United States. I’m very happy that he is and I pray that he will be a good instrument of God and will be able to make this world a better place. I am so happy that he has lived in a different country (Indonesia) for a few years as it makes a huge difference in the personality and perspective of different issues in life. Every person who aspires to become a President should try to live in a different county before as he/she will definitely be a much better President. I have to confess that I couldn’t read “Audacity of Hope” by Barack Obama as it has too much of information about politics and wasn’t an easy read for me. It was interesting to read about his trip to Kenya. During that era, if he would have been of an Indian origin he would have had similar experience from relatives in India. I couldn’t stop laughing. It took me a long time to finish this book, Abraham Lincoln: A Biography by Benjamin P. Thomas. I am so glad that I finally know a little bit about the Great President of the United States, Abraham Lincoln. Shri Mataji has always praised him as he was a realized soul. So, I was very curious about his life. He seems to be a very average person with a humble beginning. He was self educated, a great speaker, ambitious and a hard worker. It seems like God chose him to be the President. And, when he sat in the throne as a President, it seems to me that he actually evolved as a compassionate human being with trust in people and in God. Emancipation Proclamation seems to be a vision that was directed by the great Power above us as even he couldn’t have imagined that this would put America in the path of Greatness. It is inspiring how he could be detached and devoid of any ego whatsoever. He chose people in high posts if they were good neglecting the fact that they were against him. By being so detached and forgiving, he won many hearts of so-called enemies. That’s impressive.